The latest: Johnny and Co. would like to send out their best wishes to the friends and family of the late harp master Pat Ramsey, who died November 17 at the age of 55 after a long illness. Pat made some remarkable contributions to Johnny's 1978 release White Hot & Blue. 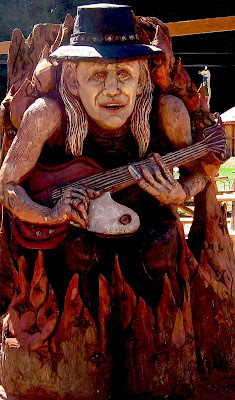 For a complete roundup of all things Johnny Winter, including his current tour dates and the details of his upcoming appearance at the Warren Haynes Christmas Jam in Asheville, North Carolina, visit our friends at LiveBluesWorld.com. The latest: Johnny is currently on tour across the pond, and he'll be back later this month. In the meantime, get the latest update on his travels and happenings via our friends at LiveBluesWorld.com. We'll even give you an explanation of the above photo! And while you're over there, check out the brand-spankin'-new discussion board, where you can discuss all things Johnny with fellow fans.